Containers (aka Totes or Lugs) and Bulk Bins …No matter what you call them, they are indispensable. Whether you are harvesting, fermenting, graining out, or need to haul, ship or store a multitude of materials, having the right container for the job (and enough of them) can impact productivity and efficiency. So, let’s talk a little about the characteristics of our plastic containers and how to decide which one is the best for you. FDA-compliant materials. Our harvest containers are made of food safe, high-density polyethylene that is freezer safe and 100% recyclable. The smooth, easy to clean surfaces ensure a sanitary environment. They don’t harbor splinters, pests, pathogens, mold or other undesirable elements like wood bins. They also offer a consistent, more accurate tare weight than wood containers that absorb excess moisture and water. Light weight and strong, they are also UV resistant. Whether or not you need an FDA-compliant material, these high-quality containers are designed for the job and built to last. Solid vs vented. Do you need vented or solid containers? Solid containers are more all-purpose, perfect for anything from hauling spent grain, to harvesting fruits and vegetables, to fermenting grapes, or even more heavy-duty uses. The smooth interior surfaces allow for better packout. Larger vented containers have holes on the sides and bottom to allow for optimal ventilation for faster cooler and processing times, and are best for certain types of harvest items and for use in more humid environments. The smaller vented containers have holes on the sides, ends and bottom-- specifically designed to allow for the quick transfer of heat. Color-coding. Purchasing color-coded containers may be required for some uses, a part of your food safety HACCP plan, or simply because it makes common sense or is more functional (for example, choosing like or contrasting colored containers for your harvest items). Whatever the reason, color-coding is an important part of both food safety and tracking your containers (speaking of tracking – ask us about having your logo or name printed on your containers). Harvest Containers, also called our General-Purpose Containers. 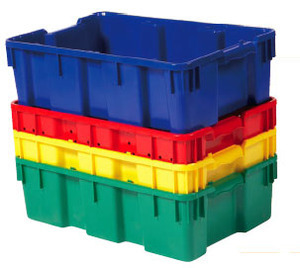 These containers can be carried when filled, so they are also called totes or lugs. This type of container is both stackable and nestable. Stackable to ensure materials don’t get crushed, and nestable (they sink down into each other) for efficient storage and transporting when empty. We also carry smaller versions -- our Agricultural Trays, and several tote sizes of Berry Trays/Flats. MACX® Bins (w/ runners and optional lids). These larger bulk containers are tough, yet lightweight, and are able to be moved by hand when empty. When full (max capacity of 1,500 lbs.) a pallet jack or forklift is required. Two options for runners are offered, 2 long-side or 3 short-side. The bins, that come vented in gray and solid in color-coded options, are stackable up to 10 high, and 3 can be nested at a time. Short-side vs. long-side runners. When choosing 2 long-side runners vs 3 short-side runners, the use of a pallet jack or forklift is part of the decision-making process. What your application is, and the size/configuration of your storage area, typically dictate which machine is best. Regardless, if you choose a 2 or 3 runner configuration, you still have four-way entry with a forklift. Forklifts require more space than a pallet jack, but if you require a dumping motion or need to stack containers high, it’s your best bet. Forklifts can also enter all 4 ways when lifting either the 2 long-side runner bins or the 3 short-sides ones. Pallet jacks are better when you have a smaller storage space and require more mobility, but are more limited in capability. Pallet jacks require you enter the same way that the runners are going, and since they use the floor for lift, it can’t be inserted between the runner and the bin, reducing stability. Unpack carefully. Check your delivery for containers that are nested or tucked into each other. Often, containers are fitted together for most efficient shipping and it may appear that you are missing some. Plan ahead! Planning about a month out will give you ample time to make sure your desired color(s) are in stock and your shipment has enough transit time to get to you. Transit time can vary depending on what area of the country you are located. Check out the Containers section of our website for more information these items, plus others like our Shellfish and Oyster Container, at https://www.unionjackstable.com/containers-bins-lugs-totes/. We are here to answer any questions and help you choose the right containers for your job.